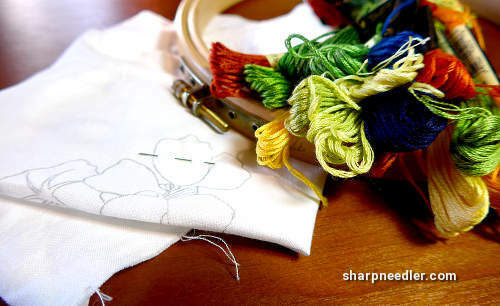 A bouquet of floss, a new needle, a hoop, and a freshly drawn design means only one thing: a new project! I recently needed an embroidery project that was portable. Nothing I'm currently working on could be easily carried around, so I looked around for something appropriate. 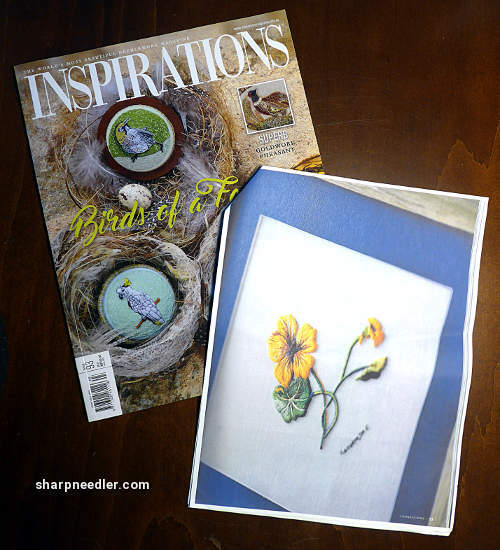 I've had my eye on a project in Inspirations issue 93 called Capucines. It's a thread painting design by Catherine Laurençon. I've been a fan of hers and have wanted to stitch one of Laurençon's designs for a long time. 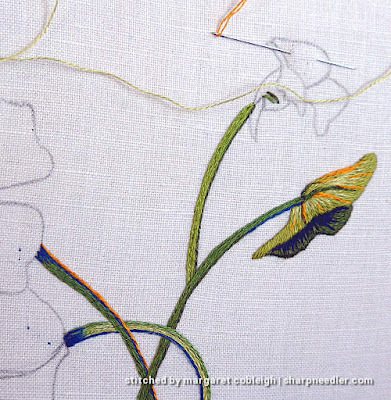 She posts the most gorgeous photos of her students' work-in-progress on her blog. It's well worth checking out (see link at the end of this post). Catherine Laurençon creates designs with fabulous palettes of bold colours. She has a different style than say, Trish Burr. For example, the colours aren't necessarily smoothly blended, but can occur in blocks. That is certainly not a criticism. Both styles are great, just different. Vive la difference, right? To the right is the main flower and leaf from Capucines. Notice how there are unblended sections of colour on the flower and the leaf. Also, notice how Laurençon uses non-realistic colour to create a highlight on the leaf in orange and shadows in blue on the stems; these complementary colours serve to accentuate the design's depth. I'm looking forward to stitching with colours that aren't commonly found in designs/kits, like orange. I expect this project to have some challenges for me. I've spent a lot of effort trying to create smooth blends in my thread painted projects and avoiding blocks of colour. 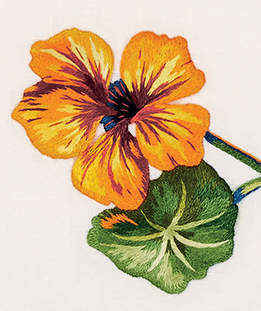 However, I believe it will be a pleasure to stitch these capucines, also known as nasturtiums. I have a soft spot for these flowers. They grow wild in my neighbourhood canyons every year. The bright oranges, yellows, and greens are quite a welcome sight in the spring. When I stitch a project from a magazine or book, the first thing I do is make colour copies of the instructional pages. That way I can write notes on the copies without making a mess of the original publication. 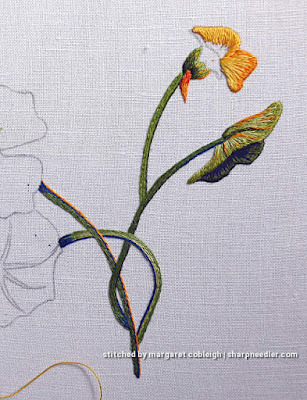 The nasturtiums project calls for a 10-inch square piece of fabric and an 8-inch hoop. I think a 12-inch square piece of fabric would work better. I happened to have a strip of 13-inch fabric so I am stitching on a piece that is 10 by 13 inches, and I really appreciate having the extra material on the 13-inch side! My 8-inch hoop (1/2 inch deep) was too big for the 10-inch part of the fabric; there was almost no excess material around the hoop with which to pull the fabric taut. A 1/4-inch deep hoop would work a bit better, but not by much. I prefer deeper hoops except on very small projects. I've switched to a 7-inch (1/2-inch deep) hoop which is working better, but is closer to the design so hoop marks could be a problem when framing/finishing. I am also not stitching in the order as described in the instructions. I prefer stitching elements from the back of the design to the front. So, I stitched the stems first. The stems were fun and I especially like how they twist and turn around each other. I love the orange highlight on the stem belonging to the big flower. I tried a little experiment on the stems. The directions called for stem stitch. I'm used to using split stitch and it's been in the back of my mind to see if it makes any difference whether or not you use split or stem stitch on an element like a stem. I stitched most of the stems with stem stitch, but I did one in split. I can't tell the difference and I prefer split because it's easier to stop and start which occurred a lot on the stems because of the way they overlap. I was very careful to stitch from back to front so I did a lot of partial stems as I coloured in the stem lines. 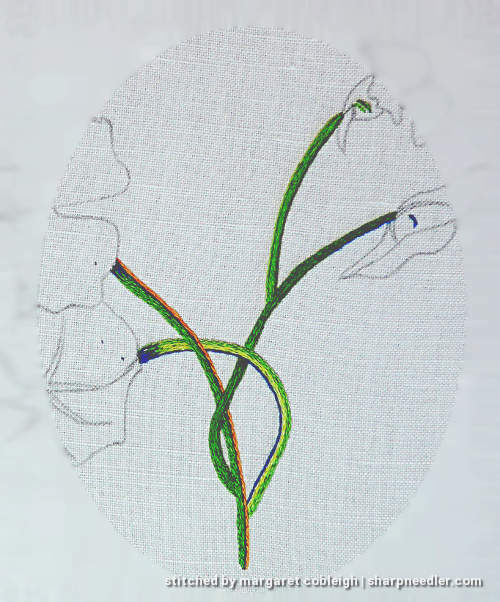 By the way, the split stitched stem is the one for the big flower. Next, it was on to the small leaf to the right (with orange highlights). Finally, I started working on the bud. I'm really enjoying stitching with the oranges. It's invigorating! The project is coming along quite quickly. I'm looking forward to working on the main flower and leaf very soon! Thank you. It's a lot of fun to work on. Her designs are really lovely aren't they, and you have made a lovely start. Beautiful stitching! I hope you enjoy it. Oh, yes, I think Ms. Laurençon is an amazing artist and am thrilled to be working on one of her designs. Thank you for the compliment on my work! Beautiful, I look forward to seeing your progress. Every garden should have both orange and purple. All content copyright Margaret Cobleigh and may not be used without permission. All content copyright by Margaret Cobleigh. May not be reproduced without permission.